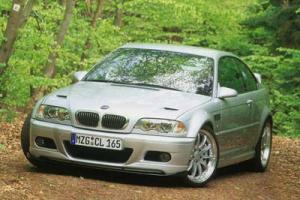 Such was the success of its older brother, when the E46 3-Series was launched it was clear that BMW were planning a vast array of engine and body style variant for this car. Tuners found it very difficult to decide upon which model they should purchase in order to conduct their development work. The BMW engines had been developed to a very high specific power output, rendering conventional tuning methods virtually useless. Cylinder head tuning and optimisation virtually disappeared overnight, and the big guns started to look for alternatives. Hartge embarked on a supercharging project for the 330i, but also diverted resource toward the amazing H50, an M5 engined 3 series with up to 460hp! Clearly a car for the deep of pocket, and very rare indeed in the UK. However, chassis and driveline modification, notably limited-slip differentials, to allow full use of the increasing power outputs became hugely popular. Much of this equipment is still available today, and we even have Hartge's original 330 based supercharged demonstrator still in our stable. All current elements of conversion equipment for this car can be found here.